The RSPB put out a call for the Great Big Garden Birdwatch last month, a very noble enterprise and one which must give them a great deal of data from which to do their work. At home however in the centre of Edinburgh we have our own bird problem. We have a pigeon problem to be precise. Since they do not migrate south (nobody seems to have told them how lovely Tenerife would be for them during the winter months) and are permanent residents, they are a constant pest. Yes, I know there are loads of people who love to have them land on their hands and peck the grain or bits of bread they are offering, but do they know how many germs there are on one of these feathered fleapits? Anyway back to Percy. He took to living at the back of our house on a ledge a couple of floors up last summer. So he is not cooing in our bedroom window, but he is quite loud and is making a bit of a mess of the wooden decking underneath him. So much so, that action has been taken. Freddie has now moved in. That is Freddie the Falcon who has a commanding air about him and is really scary. I, at least, am scared every time I walk into the study when I see him peering in the window there! I keep forgetting about him sitting on his perch. This is the humane approach to our pigeon problem. Quite how we would achieve the same result by any other means is beyond me. So watch this space. For a few days we have not heard anything from Percy, but I suppose the danger is that he might get used to his new friend in time…. Elsewhere in the city it is seagulls which have been a pest. At a city council meeting last year it was reported that one seagull had cheekily made off with a 5 pound frozen chicken thawing out on a window ledge. The way that gulls are dealt with most effectively is by removing their nests. Unless you do, the gulls simply lay more eggs and carry on regardless. So our council is spending some money on doing this, which is good news for residents in some areas where the gulls have become far too daring. 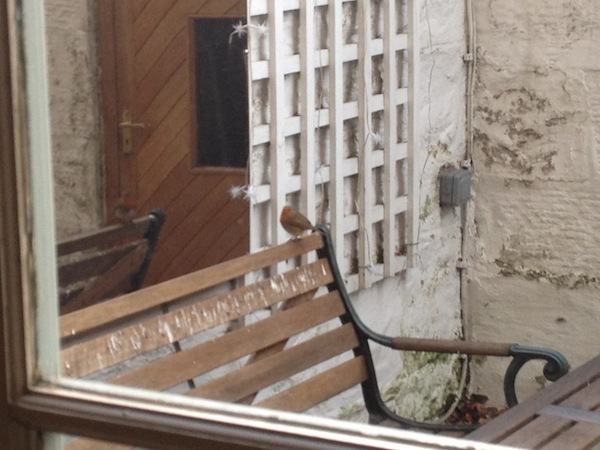 And finally we had a robin who had moved in while we were away at Christmas time. Our garden furniture was evidence to how long he had been here, although he did not believe he was on his own. He regularly flew to roost on the garden seat and talk to the other robin who also lived here. Except it was not a new friend, but rather his reflection in a mirror. So that he would look elsewhere for a mate we moved the seat and have not seen him since. Pity, because I was actually quite fond of him! Next We have a new Pippa… thank goodness….